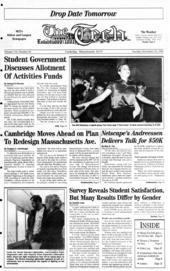 Cambridge Moves Ahead on Plan To Redesign Massachusetts Ave.
Is The Tech's Quality a Fluke? The MIT-Wellesley a capella group The Toons sing "I Feel Lucky" at their concert Saturday in 6-120. Douglas W. Donaldson '00 slides the ouck under the glove of the Lyndon State College goalie to score during the first period. Donaldson also had the game-winning goal in the hockey team's 5-3 victory on Saturday.